If you’re vegetarian, or catering for one, you needn’t restrict yourself to quiche and pineapple sticks – make some interesting party food using seasonal ingredients. Keep it simple and easy when preparing party food – otherwise you’ll just be hot and stressed when the guests arrive! Choose three or four types of cooked canapé and serve them alongside a selection of healthy crudités, fresh bread, nuts, and a cheese platter. You can now buy excellent frozen canapés for vegetarians, including cheese sausage rolls and mock ‘chicken’ dippers. You could also make your own dips, such as hummus and baba ganoush, to serve alongside warmed pitta breads or breadsticks. Here’s a selection of our favourite seasonal food recipes for vegetarians. 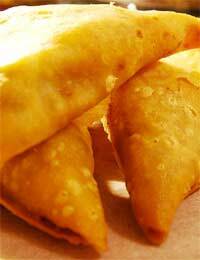 Small, spicy samosas are great cocktail or party food. Make them small enough and you can poke cocktail sticks in to make them easier to eat. Folding the triangles takes a bit of practice, but you’ll soon have it sussed. 1 large butternut squash, peeled and cut into 1cm cubes. 1 package filo pastry, defrosted. In a cup, soak the coconut in the lemon juice (set aside). Toss the squash cubes with the korma paste and roast in a hot oven for 20 minutes, or until tender and tinged with gold at the edges. Put the flaked almonds into a dry frying pan and toast over a medium heat until brown. Put the almonds and squash into a bowl. Add the coconut and fresh coriander, and stir gently. Unroll one sheet of filo pastry and cut a long, thin rectangle, about 30cm x 7cm. Put a generous spoonful of filling at the top left corner and fold it diagonally, then keep folding until all of the pastry is wrapped around the triangle. Brush the final edge with butter and press to seal the samosa. Make all the samosas in this way. Bake at 180 degrees C for 15-20 minutes or until crisp and golden. 1 packet prepared Crostini (find them with crackers at the supermarket). 2 logs (about 200g) mild Goat’s Cheese or good Brie. Preheat the oven to 140 degrees C. The Crostini take just five minutes to assemble. Lay them out on baking trays, discarding any broken pieces. Spoon a very small teaspoonful of cranberry compote on each one, then use your fingers to crumble the goat’s cheese and put a little chunk on each Crostini. The idea is to make these quite small so they’re easy to eat in one bite. Grind over some fresh pepper and sprinkle with sea salt, then put into the hot oven for 5-7 minutes (until the cheese is starting to soften). Cool for a couple of minutes before offering on platters, scattered with fresh parsley if liked. I appreciate all your meals, but i just needsimple meal for my colleagues, Cake never being the preferrable favourite for my birthday. Bring simple meal with MEAT & veggies for the gemini, i will appreciate. Thanks.